Lime juice and lemon soda with loads of ice have always been my summer buddies. I do experiment with them, but the options are limited. No wonder, I have the gorgeous sunny lemons sitting in my fridge at all times. But only until I found this wonderful recipe on the net. I couldn’t wait to try out this version of watermelon with a dash of fresh, aromatic and cooling mint to it. 1. 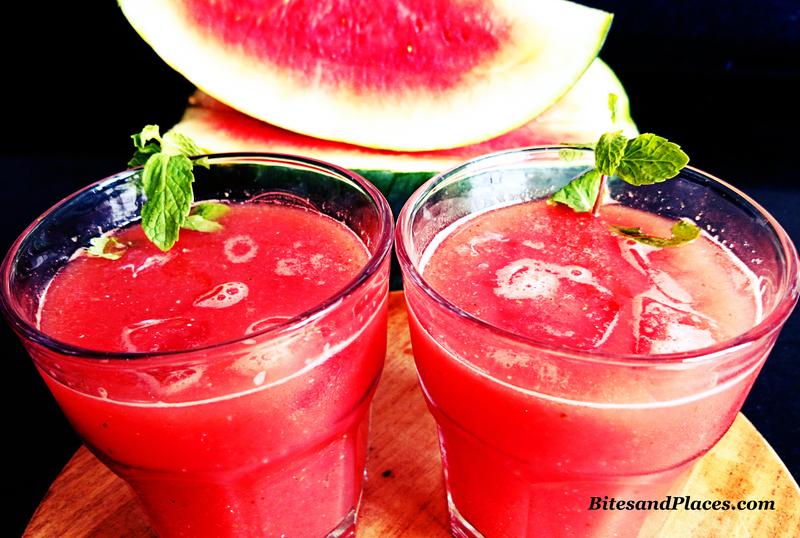 Combine water,mint, jalapeno/chilly, sugar, watermelon, lemon juice and blend to a puree. The ingredients are quiet a quantity, so blend in batches. 3. Strain the mixture through a sieve. 4. Leave it in the fridge for a while and for that extra cooling. 5. While serving, toss some ice cubes in the serving glass and pour the lemonade over. I love the way the cubes start to float in that bright scarlet liquid. Beat the summer heat with this super-refreshing cooler.